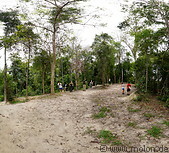 The Belum-Temenggor rainforest is home to some of the world's most threatened mammals such as for instance the Malaysian Tiger, the Malaysian Sun Bear, the Sumatran Rhinoceros, the white-handed Gibbon, the Asiatic Elephant and the Malayan Tapir. According to Dr. Daniel Baskaran, the director of the Pulau Banding Rainforest Research Centre, thanks to conservation efforts, there is a stable and growing tiger population of 20-25 individuals, which in 10 years might double. The reserve has a counterpart in Thailand, so the wildlife can roam across the border in a protected area. However, because the wildlife is spread over a large area, animal sightings are not guaranteed.